Old SR 122 Road and Township Line Road NEW! Click here to read press release. 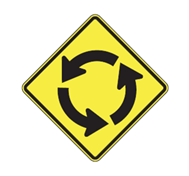 A roundabout is a circular intersection where traffic flows around the center island. Roundabouts, like all intersections, undergo thorough analysis prior to implementation to determine if it is the appropriate solution. Roundabouts can dramatically improve safety when compared to traditional four-way intersections. In fact, a recent study of 23 intersections converted to roundabouts shows a decrease in injury crashes of 76%, and a dramatic 89% decrease in fatal crashes (“Safety Effects of Roundabout Conversions in the US” insurance Institute for Highway Safety). When approaching a roundabout, slow down. Yield to traffic in the roundabout, because they have the right of way. It is the Law. Merge into the traffic flow when it is safe. If an emergency vehicle approaches, exit the roundabout immediately and then pull over—do not stop in the roundabout. When exiting the roundabout, signal your turn. Cyclists can ride with the traffic inside the roundabout. Riders who ride with traffic must follow the same rules as vehicles and must yield as they enter the roundabout. Since traffic is slower inside the roundabout, cyclists should be able to travel at or near the same speed as motorists, staying in line with the circulating traffic.